12/2000: The North Princeton Developmental Center has been listed on the National and State Registers of Historic Places. 2007: The Salem County Almshouse has been demolished. Late efforts to let a stabilization contract and raise funding were met with disappointment, and it began collapsing in on itself after years of neglect. 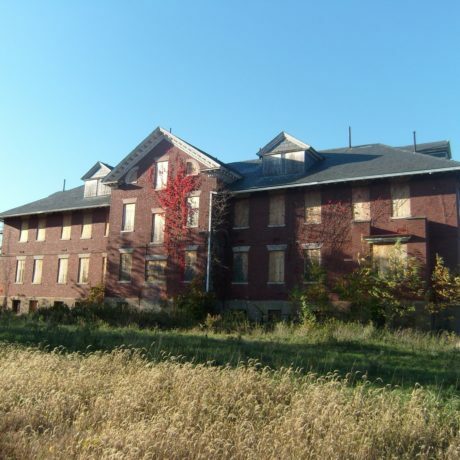 The surviving Insane Asylum building has been nominated to the National Register of Historic Places. 2008: The Salem County Insane Asylum has been listed on the National and State Registers of Historic Places. 7/2011: After years of stalled development plans and neglect, Montgomery Township, which acquired the North Princeton Developmental Center in 2007, has announced plans to demolish the 20 buildings that remain on-site by this September. 92 buildings were demolished between 2005 and 2007. The Maplewood and Pine Knoll farmhouses will be preserved, and the site will be sold to Somerset County for use as a park. From the era of “poor law” through the development of the welfare state, each age rejects the answers of their predecessors. The facilities in this multi-property designation represent three of the many institutions New Jerseyans have created in their efforts to serve social needs. Marlboro State Hospital, opened in 1931, is one of three state institutions designed to house the mentally ill. It’s architecturally notable campus of central facilities and detached residence halls cover 900 acres and were designed to provide an incentive to recuperation. In 1940 it became the location of New Jersey’s first juvenile mental health facility. The buildings retain a high degree of integrity, but at the time of the list, the state has closed the hospital and its future is uncertain. The Salem County Almshouse began operation in 1798. A “poor house” was built in 1845 and an “insane asylum” in 1870. The extant brick building dates from 1870 and was used by the county for offices until recently. Plans for the site are unknown. The North Princeton Developmental Center began in 1898 as the Skillman Village for Epileptics. Before the age of anticonvulsive drugs, epilepsy was considered hereditary and degenerative. State law forbade epileptics to marry. In 1953 the facility became the Neuro-Psychiatric Institute, growing into a research laboratory for the study of severe neurological problems. The campus, which covers two square miles and includes 70 buildings, became the North Princeton Developmental Center in 1983 and subsequently closed in 1988. PNJ understands the changing social priorities that have led to the closure of these facilities. However, we assert that this closure should not automatically precipitate abandonment and neglect of these significant historic landmarks. These facilities were an important part of society, and stand ready to continue to teach important lessons about social needs and how our understanding and treatment of such has progressed, provided we insist on preservation-conscious planning for their futures.